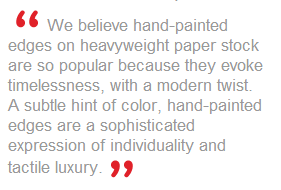 The hand painting of paper edges is enjoying a renewed appreciation among modern consumers of fine stationery and invitations. In response to this trend, William Arthur, Inc. has introduced a line of stationery featuring custom, hand-painted edges on business, calling and correspondence cards, as well as on wedding and event invitations. Painting the edges of paper began as a bookbinding practice in the 13th century as a way to help preserve the edges of book pages. Later, in the 18th century, the edges of devotional books were painted red. The edging process evolved into a rise in popularity of gilt-edged books in the 19th and 20th centuries as a sign of status. Hand-painted edges have enjoyed resurgence in recent years in the wedding and fine stationery milieu, especially among younger consumers.